To end the week on a fun note . 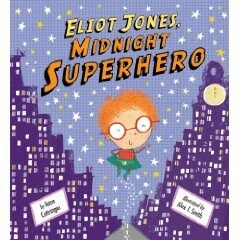 . .
Why Eliot Jones, Midnight Superhero ? Because it's just fun, that's why. "By day, Eliot is quiet. He watches Mr. Smith wash his car. But when the clock strikes midnight . . . He swims, he climbs, he slueths. Then, he receives his most urgent and dangerous message ever -- a gigantic meteor is heading towards the planet earth. Whatever will he do? Well, thankfully Eliot has built a Meteor-Busting Rocket Launcher for just such occasions. Naturally, he saves the earth and is met with wild and thunderous applause. But being a superhero by night makes him one quiet, and tired boy during the day. But don't underestimate Eliot. He's not quite what you think! I thought this book, written by Anne Cottringer and illustrated by Alex T. Smith was quite clever. It's like The Impossibles without squabbling children. Eliot is just a curly headed red head with a cool green cape whose only mission in life is to save the planet. This is a really fun, goofy and silly story from Tiger Tales. Absolutely cute and fun in every way. Did I say fun? Just checking. Because if I didn't, I certainly meant to. Oh! my! Gosh! My son's name is Elliot Jones! I want this book. Of course he's 14 and has wild brown curls instead of red hair, but still. If nothing else, his younger sister would use it as a source of mocking him. In love, of course. Max LOVES this book! (Yes, I let him open it!) LOVES it! LOVELY! An excellent for fun book!